Keeping a fish at home is not just a hobby for some pet enthusiasts, it’ a great addition to their homes. Fish tanks make a great entertaining accessory for other pets in the house, keeping them engaged rather than involving in destruction activities. Many people are increasingly considering to use small tanks in small spaces around their home only because it looks great. However, fishes do need a lot of care; keeping them in shape, healthy and cleaning up their messes require a lot of your time. Now, when we say mess, we mean excess food, dirt, algae growth and other debris getting into the fish tank. Therefore, to keep the fish tank clean, all you need is an excellent fish tank filter that’s available in the market. Choosing the right type of fish is very difficult because of an array of options available. In whatever way, not all of them are meant to do the job correctly, so it narrows down to having the right information while making your purchase. Luckily, we have done our research and come up with the best types of fish tank filters available. By the end of the article, you’ll surely have your mind made up. 10 Best Fish Tank Filter Reviewed! A filter with the name Fluval on it is something appealing. So, will this Fluval External Filter fulfill your expectations? Sure, it will! It has a strong motor along with additional reliability, just what you need in a fish tank filter. The fish tank filter is something that you’d be using for years after years, for which the most important thing about it is a healthy body on the outside. Well, a sturdy interior case is important too. This model is very sturdy that can handle more water compared to an average round canister filter. It boasts better filtration of water of up to 100 gallons. The hydraulic motor improves the flow rate and increases filtration while reducing the need for maintenance. The good part is that the filter delivers noiseless performance that makes it stand apart from the crowd. Thanks to the sound-dampening system that makes it the quietest filter out of all. The filter is designed in such a way that the water in the aquarium will have to go through the filtration process to end up with clean water. The square design contributes to the distribution of water for better filtration efficiency. The model has a coarse sponge included in it and 3 additional media baskets. What the baskets do is get the job of chemical filtration done. Therefore, it makes the perfect filtration system for messy fishes like goldfish, still turtles, cichlids and so on. The Fluval External Filter is a great model for large aquariums. The product being sturdy ensures you that it’s going to last longer. If you have already bought an aquarium, the next thing that you should buy is the Penn Plax Cascade Canister Aquarium Filter. That’s because it promises to keep your filter clean all the time. Penn Plax models are always worth mentioning because of the features that they come with. Here’s one best canister filter you’ll ever come across. First off, this model is designed with extremely high-quality, durable materials that are known to last a long time. The hard-plastic delivers definitely is very durable. And a little care on top of that makes it lasts even longer. The model has a very good filtration process along with superior capacity. It’s able to flow approximately 312 gallons of water per hour. Isn’t that great? In addition to that, it includes a spray bar that makes water aeration and circulation easier than others. In short, the filter makes sure that the aquarium water is filtered as soon as possible. This filter comes with 3 large filter trays that’s enough to help with the entire filtration process. Not even a single dirt could pass through the filtration media. The whole idea is to provide the best filtration process. And you don’t need to worry about setting the fish tank filter. With a small push button, you can effortlessly prime the filter. Admittedly, it works great when you clean it regularly. Make sure to unplug the filter from its mounting position before you finally wash it. Moreover, the air-tight seal ensures a noiseless operation under any circumstances. Easy-to-install, affordable with great flow-rate control, this fish tank filter is a great buy. Cannister filters have grown to become one of the crowd’s favorites. 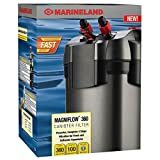 This latest designed canister filter from Marineland is a spill-free, quick support system for your fish tank. You’d be amazed at how great features it comes with. It’s designed for both freshwater and marine water aquariums that’s simple and quick to use. The multistage filtration promises a clean and healthy aquatic condition through chemical, mechanical and biological filtration. On top of that, the FilterFoam pads screen out every single evil dirt and debris out of the tank water. 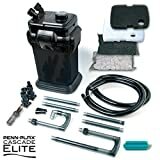 The filter is all about unique features with user-friendly components makes keeping up your fish tank more plain and simple than ever before. For instance, the fish tank has a lid that creates a water-tight sealed compression when lifting up for little expulsion. Furthermore, it has the Stack n’ Flow filter plate technology that permits different media layers for completion of mechanical, chemical and biological filtration. It’s totally simple and easy to take off and change/clean the media. You will love the fast-prime button that loads the filter chamber with water for quick and self-priming setup. It also has a specially designed valve that lets you close the flow of water immediately, and separate the cover from the engine housing for better, spill-free fishing experience. The advanced components include tools that you need to create a flawless, healthy aquatic condition with significantly less exertion. It’s all about how nicely the filter is made. Marineland has been producing the fish tank equipment, which includes filters as well since the 1970s. So, when choosing MarineLand, you will not go wrong with it. Hydor has been manufacturing aquarium related products for quite long now, and just when they decided to step into the filter business, it surely created a buzz based on the features that they have to offer. Many people aren’t comfortable with a canister filter, but it actually has some of the best features and functionalities that we’d like to highlight. From the first time you have it in your hands, you’ll conclude that it’s a fantastic product. Well-constructed with high-quality materials, the filter makes sure that it’s sealed properly and having no water leaks. Moving on to its impressive flow rate and capacity, like an aquarium owner, you’d be proud to own the best flow rate ever: Hydor Professional External Canister Filter. It can flow from 240 gallons per hour up to 280 gallons per hour. That’s too good! If you’re worried about whether the filter would make noise, then fret not! It’s completely soundproofed. You won’t hear a single humming noise while it’s operating. For this model, the filtration media layers come in 3 media trays. It’s enough for you to handle the filtration needs of your aquarium. You can even arrange it as per the requirements of your aquarium. Plus, it has enough room in the canister chamber for you to change its orientation the way you want. At one point, you’ll need to open up the fish tank for maintenance. So, do take care of what’s on the inside to extend its lifetime. While cleaning it, make sure that the impeller is un-mounted for thorough cleaning. You will have a good time maintaining your fish tank with this filter. There are no lags at all while having a great filtration process. If you’re looking for an effective, yet useful filter for your fish tank, you must keep in mind about this model. Another one of the best companies that’s mention-worthy produce the best fish tank filters is Eheim. This filter is very compact, yet highly reliable for what it comes for. Take a look at what Eheim 2217 Classic Filter has in store. To begin with, it has a pump unit that is very well-engineered, requiring zero maintenance. If you’re looking for a filter that doesn’t need much of your attention, then you can purchase this one with complete peace of mind. This filter has all the qualities that you would ever want: stable performance, proven technology and high-efficiency mark that filters the water well enough. On top of that, the chamber design enables you to have a high flex in setting up for chemical, mechanical, biological and adsorptive filtration. It has the perfect and precise calculated the exact balance that’s required between biological and mechanical long-term filtration, oxygen enrichment and water circulation. Therefore, it produces optimal results for keeping the aquarium in a healthy condition. Nonetheless, it’s ideal for tanks up to 264 gallons per hour, which is quite a lot. In fact, it also includes carbon pads that are packed with ehfisubstrat and ehfimech, both of the substances that help remove harmful bacteria. The Eheim 2217 Classic Filter is well-known for its highly active purification and intensive biological decomposition of harmful substances. Moreover, it is pH and KH neutral, which doesn’t affect the water chemistry in any way. All you need to do is swap to new filters when you need to change it. However, the manufacturers suggest you provide your filter with an overhaul after at least 3 – 6 months. Another filter from Fluval. This one is the ultimate filter for every fish enthusiast because it’s really worth it. Check out what makes it so unique and, in the end, don’t forget to take a look at the cons! Fluval Canister Filter FX6 has earned its position to be the ultimate filter in the industry because of its superior capabilities, performance, and delivery. It holds as large as a 400-gallon capacity and can handle up to 924 gallons per hour. This makes it an impressively enormous model for most large fish tanks. The precise engineering makes sure that it makes no noise in the room. Not even a single vibration can be heard from the Fluval Canister Filter FX6. It has a twin output nozzle that helps in distributing filtered water all around the corners. Something that we admire about this filter is that the manufacturer has put in an electronic circuit board that aids in smooth operation and maximum output while operating. Maintaining the filter is so much more comfortable with the aqua stop valves that come with it. 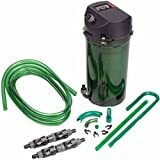 This tank filter offers a self-priming system that makes your life easier while using the filter. It’s designed in such a way that it automatically fills the filter with an appropriate amount of water before it begins the filtration process. You need to be a little patient to give at least 2 minutes for it to self-start its filtration process. The Fluval Canister Filter FX6 is an excellent value for your money. With a monthly reminder for maintenance, it has one of the smartest in-built systems that you’ll ever come across in a filter. First of all, this hangs on the filter is very compact and very easy to install. It’s made from high-quality plastic, and the Activated Carbon Filter that passes through and returns back to the tank remains to be in an all-clean state. Usually, medium-sized filters don’t allow you to add filter media, but this Aqua Clear Fish Tank Filter provides for up to seven times more media filter compared to its competitors. Moreover, this filter has something exceptional. It has a UV filtration option that can be used to control algae. Although you won’t be using it all the time, you do need this to encourage plants to grow inside the aquarium. The filter is extremely versatile; you can even control the flow rate. Sometimes the flow might be too strong or too weak. In that case, you can adjust the flow rate that will not compromise the filtering process in any way. The device will continue to function in its own way, but it’s just that you won’t notice much movement in the water. The Aqua Clear Fish Tank Filter needs to be cleaned every two weeks, which might be a little too hectic for some of you have a busy schedule. But don’t worry, since it’s effortless maintenance and saves you a lot of effort by keeping your fishes and plants healthy under all circumstances. If you are still thinking, we’d say that you can never go wrong with this filter. Plus, it comes with a lifetime warranty, so all hail Aqua Clear Fish Tank Filter. Without any doubt, the Penn Plax Cascade Canister Aquarium Filter is one of those worth-mentioning filters that we’ve come across. It’s still one of the most popular brands and the best canister filters that you need for your aquarium. This model offers the best durability. Although it’s constructed from plastic, it delivers on your need and lasts a long time. It still depends on how you take care of it. Make sure you maintain it regularly to make it last longer. If setting up the scariest part for you, then fret not; this filter is very easy to set up, coming with proper instructions. You don’t need to call a plumber, because you can do it yourself in under 15 minutes. While having a good flow rate is essential, thanks to its superior capacity that can offer about 312 gallons per hour. It comes with a spray bar that helps in making the water aeration and circulation so much easier than before. Your fish tank water gets filtered in the shortest interval possible. In addition to that, the swimming pool style rotating valves control the flow of the water. You can even remove the flow valves for better cleanup. If you are a fish enthusiast with a big aquarium, you do understand the importance of getting the right filter. Sometimes it becomes a massive challenge for you to get rid of the dirt while maintaining a clean water aquarium. But the SunSun Hw303B Pro Canister Filter does it all okay. The Hw303B is well known for its impressive capacity of filtering 525 gallons of water per hour. If you need your aquarium to stay clean and filter quickly, this is what you are looking for. The whole idea of getting a canister filter is that it usually has the three-stage filtration process that increases the cleanliness of the water effectively. It also has the 9W UV sterilizer model, which kills any harmful bacteria and algae. Best of all, it keeps the fishes healthy and lively at all times. You won’t hear any noise from the filter unless you are very near to it. So, now you can enjoy a peaceful night’s sleep while keeping the aquarium clean both at the same time. You can install the Hw303B effortless with just a few steps. And if there’s anything that you don’t understand, then the manual is there with its clear instructions. Although the model comes with an easy to control and installation system, you won’t be facing any issues with it. Apart from that, it’s very easy to maintain. Replacing the filter media shouldn’t be a problem in any way. With this filter by your side, you will always be in peace knowing that your aquarium is well clean and that your fishes are healthy. If you are a novice, you might have just bought a water filter that doesn’t quite work very well now. Well, that’s not the end of the world. 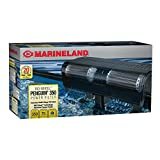 We now have the Marineland Penguin Power Filter that would solve all your problems. This model is specifically designed for those who are hobbyists and beginners, to help them handle their aquarium perfectly well. It comes in four different sizes that help you in choosing which one is the best for your aquarium. So, now there’s something for your aquarium, no matter how small or big it is. Whichever size you choose, know that this model does an excellent job at keeping your water crystal clear. All credit goes to the bioload that’s included in it. The high-quality filter cartridges effortlessly disappear the leftover fish food or any other mess from the fishes immediately. In the end, you will notice that your aquarium water has become the cleanest and best environment for your fishes. The Marineland Penguin Power Filter easily qualifies to become the most efficient model of all with its three-step filtration processes. Moreover, the three important filtration media includes mechanical, biological and chemical. Something unique about this model is the bio-wheel that’s beneficial for filtering and keeping out any ammonia and toxins out of the tank. Therefore, if you can maintain it adequately, it will ensure that it runs efficiently and quietly. On top of that, the Black Diamond Premium Activated Carbon removes any strong odors, impurities, and discoloration from the water. This patented design proves to be the best for removing toxic ammonia and nitrite. For water filtration, there are three different kinds: chemical, mechanical and biological. Chemical filtration doesn’t come with every aquarium filter, but it surely is a need for your system. The chemical filtration is what filters out toxic and unwanted chemicals from the water to enhance its quality. Some rare fish breeds may have some specific preferences for the water that they will be in, so you need to modify it accordingly. If your ordinary tap water contains high levels of chlorine or other harmful chemicals, you will need a chemical filtration to maintain a healthy water balance. Mechanical filtration removes any unnecessary particles from the water. Hence, it keeps the water crystal clear and free of any unknown particles floating inside the water. Mechanical filtration also removes different sized particles by flowing through various types of media. Biological filtration focuses on the micro-life inside the aquarium. Fish waste creates a lot of toxins byproducts in the water. By maintaining beneficial water bacteria, the biological filtration enhances the breaking down of ammonia into nitrates that could be utilized by plants or removed through regular cleaning and water changes. There are a number of different styles of filters that you could choose from. However, you need to ensure that the filter type matches your needs. Some forms are better than the others, but always choose the one that fits with your aquarium. Internal filters usually sit inside an aquarium, generally at the top of the tank. It can be mounted with suction cups and then nestled on top of the substrate that’s attached to the corner of the tank. These filters mainly rely on air to push up from the bottom of the filter and then move water through it. They come with sponges and activated carbon with them. These are low-flow filters that are designed specifically for smaller tanks. Under gravel, filters pose underneath the gravel substrate in the tank and work by flowing water in through slots on the top. Most under gravel filters concentrate on mechanical filtration rather than chemical or biological filtration. They work great on smaller tanks but requires more maintenance than the other types of filters. Hang on back filters, also known as power filters, hang on the outside of an aquarium with a small tube that reaches inside to cycle water through. The more substantial hanging part of the filter can be broken down into several cartridges containing media for chemical, mechanical and biological filtration. An external filter as such is easier to maintain and come with an array of sizes for different tanks. They do not make excellent filters for small aquariums, the water of which can easily get disturbed by strong water flow. Canister filters are customarily installed outside of a tank that forms a pressurized flow of water. They are mostly preferred by fish enthusiasts because it draws water in with a siphon and runs it through separate filtered sections, which by the way, performs all three types of filtration. As a pressurized system, it doesn’t need gravity or air to move water; chemical and mechanical filtration are good enough in such filters, while biological filtration is restricted. Sump filters come with a heater and water pump. Previously, sump filters were mostly used in saltwater tanks, but nowadays, it’s used in both freshwater and saltwater tanks. It has a very simple design that’s relatively efficient, especially for larger tanks. Let us tell you that sump filters make excellent filters because of its ability to store more media than an ordinary filter. You can bring extra water volume to the system that is definitely beneficial for your tank. Fish tank filters are designed in such a way that it works within a certain power range. The strength of it sometimes mentioned in units of power like volts is the capacity the filter can take up to. We would recommend you to choose a filter that can support your aquarium or a larger one. Never go for a filter that is intended for a smaller sized tank. It’s crucial that you need to match your filter to your aquarium size. You might see that the water inside the aquarium is crystal clear, but in reality, it could be affecting the life of your fish, plants and other marine beings. Make sure that you don’t overwork your filter. If your tank is 55 gallons, you need a filter that can handle 55 gallons or more. It’s a better idea to buy something that’s able to do more than less. Without an appropriately sized filter, you will see a loss in your aquarium life. Branded products are always “the best.” Although they are a little expensive, they are more reliable than others. Consider Penn Plax, AquaClear, Marineland, Eheim, and Fluval, they are not just reliable but also guarantee a better product overall. These brands come with uninterrupted service for years after years, needing little to very less maintenance. Again, the flow rate is significant because it deals with the speed at which your aquarium will pass water through the filter. It’s best to have a filter that’s able to turn over your aquarium water within a mere 4 hours. For instance, a 40-gallon aquarium will need a filter with a minimum flow rate of 125 gallons per hour (GPH). Typically, it is always the maximum GPH to even out the situation. Q1: Does my small aquarium need a filter? Answer: Of course it does. No matter how small or large your aquarium might be, the fish and plants inside it are always producing waste. The purpose of a filter is to maintain a lively and healthy environment, minimizing your trouble of changing the water every single day. Q2: Do I need to clean my fish tank filter? Answer: Today, most of the filters are maintenance-free, but we’d still recommend you clean it out at least every 2 – 4 weeks. If it is operating at an upper range of its abilities, clean it out more often. Q3: Do all the fishes produce the same amount of waste? Answer: Not really. Some fishes are a little messier than others. For example, goldfishes and cichlids produce more waste than neon tetras. Messier fishes need a stronger filtration to maintain the same water levels. If your existing filter is not able to work very well, adding more fishes or messier fishes could lead to an unhealthy environment out there. Q4: Can I just purchase and use a filter right away? Answer: Certainly! However, biological filtration is an integral part of making sure that water quality remains consistent. Once you buy a new filter, it may not have the beneficial bacteria needed for your aquarium, but you can kickstart this process by using the media from an established tank. Q5: Which is the best fish tank filter? Answer: There’s no lousy fish tank filter; all of them are good. Our personal favorite is Eheim, because of its construct. However, the rest depends on your needs. Cycle the tank before you go on to add more fish. Take every step possible to bring in the water condition that is healthy for the fishes. Test and monitor the water parameters. There is some very inexpensive water testing kit that will help you test and monitor the pH balance, ammonia, nitrite, and nitrates in the water. Perform frequent water changes. Although it’s a little troublesome to change the water of the fish tank every now and then, there’s no alternative than replacing the water to keep your fishes healthy. Research about the fish you are about to purchase. Understand the fish’s temperament, space and how big or small it might be for your aquarium. Never overcrowd your aquarium; that’s the worst you could ever do. Never overfeed your fish. Feeding them once a day is enough. You need to starve them neither overfeed them. Fish food, it persists in the water for too long may turn out to become poisonous for your fishes. Adjust the light in and around your aquarium. Avoid the aquarium from getting direct sunlight throughout the day time. A smart way to expose them to the sun is when you are at home and keeping it dark while you are away. Undoubtedly, fishes make fantastic pets. Although they stay underwater at all times, they are still not the cleanest of all. Whenever fishes do their business, it’s all left floating on the water in the tank that you can see. You surely need a filter if you want to maintain a clean and healthy aquarium. The best fish tank filter will guarantee to keep your water looking like crystal clear. This is how you can keep watching your little creatures moving around while making the environment lively and healthy. The healthier your aquarium water is going to be, the better and more robust your fishes are going to be, thus enabling them living longer. You will see that your fishes will have a fantastic shine and glow, swimming around more happily that will keep you entertained. Remember that the smallest of the aquarium needs filters; otherwise, it would shorten the lifespan of your fishy. Understand what separates one fish tank from another and make the best choice that serves your needs. Once you have made your decision, let us know which fish tank you’ve finally purchased, we’d love to know!